These are my "cushion" days at the end of the ride. I have five days to explore Seattle and the vicinity. I made good use of the City Pass I bought yesterday and it turned out to be a much better value than I bargained for. Early this morning I rode the Monorail to the Space Needle located in Seattle's City Center neighborhood. The Monorail and City Center were built for the 1962 World's Fair and they still exist in nearly their original forms until today. 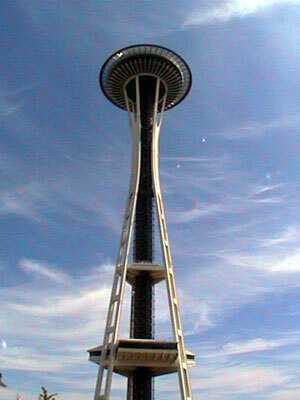 The Space Needle is a marvel of engineering. It stands 520 feet in the air and the viewing deck and rotating restaurant are accessed by a high speed elevator that wisks tourists to the top in less than 50 seconds. The view from the top is outstanding but a little cloudy this morning. 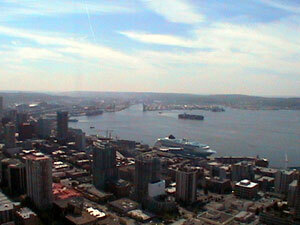 People think that it always rains in Seattle when in fact it receives less than 60 inches of precipitation each year. It is a very cloudy, dreary area with less than 100 days of sunshine. The Olympia Mountains block most of the rain producing clouds. The science museum here in town is a pretty typical science museum with the standard exhibits. There are two IMAX theaters at the science center, one 2D and one 3D, as well as an IMAX theater at the aquarium on the harbor. I watched a 3D IMAX movie on the International Space Station construction that was extraordinary. Viewers wear active 3D goggles with speakers built into them for a fullimmersion experience. It was by far the most realistic movie I've ever watched in my life! 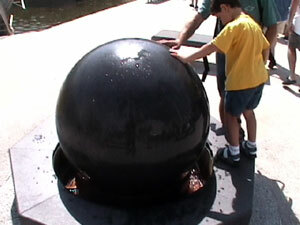 The most unique thing about the museum are the hands on water exhibits. The first picture shows an Archimedes screw, the second is a 4000 pound granite sphere that can easily be rotated on a cushion of water, and a kinetic scupture that demonstrates the law of conservation of energy and how energy is converted. 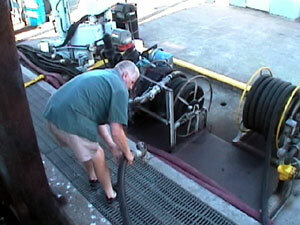 A pump sprays water toward a water wheel which is hooked up to an electric generator. 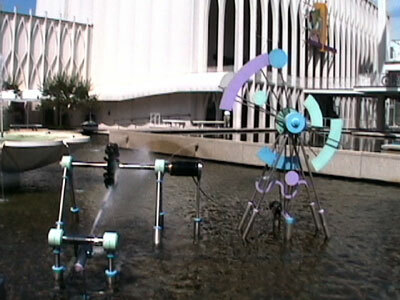 A wire then runs to a motor that moves the sculpture on the right hand side of the picture. When the water stops the sculpture stops. It's very ingenious and works very well. I had four "Insightings" today but they were easy. 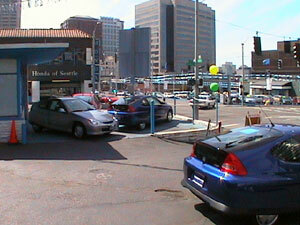 All four are 2001 CVT Insights at the Seattle Honda dealer. There were red, silver, and two blue cars on their lots. They also had a Civic Hybrid but it was out on a test drive. 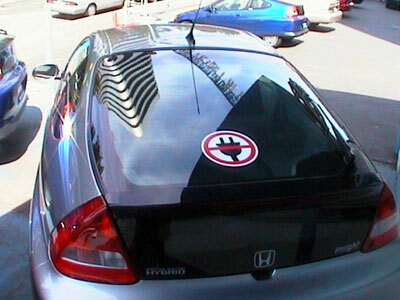 They sell them with a cool sticker on the rear window that's part of a marketing program. I asked a guy at the dealership (they are open on Sunday!) about getting one of the stickers and he said that they don't have them for sale. It's a shame because it's a cool sticker! 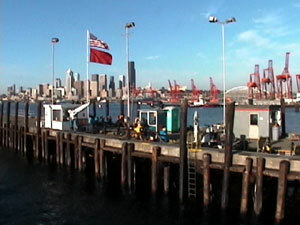 The City Pass includes a sightseeing cruise around the harbor. I was thoroughly enjoying the cruise until the boat ran out of fuel. That's right - fresh out of fuel. We drifted in the center of the harbor until the company's maintainence boat towed us to the fuel station in the south end of the harbor. It took about 45 minutes to refuel the boat then they couldn't get it started. In the mean time the bar served free drinks and once we got back to port they told us that we could redeem our ticket stub for another cruise so I'll go on one of the long, expensive ones tomorrow. 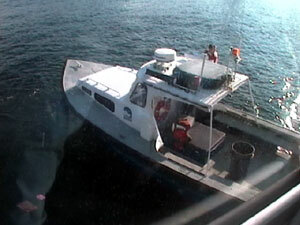 Here are pictures of the maintenance boat, fuel station, and they guy who refueled our boat. I had dinner at a great burger joint on Pier 55 and met a guy who owns an Outback Steakhouse. He aksed me what I was doing in Seattle and I told him. It blew him away! He gave me a gift certificate for dinner for two including drinks, appetizers, and dessert at any Outback Steakhouse in the country good for $45.00. Awesome! Every time I travel I'm going to tell people that I rode my bike there and I'll see how much free stuff I can get. I took a ton of pictures at the Pike Place Market near sunset as I tried to recreate a bunch of really nice photos I saw on sale today. Here is a poor picture taken in the midday sun. 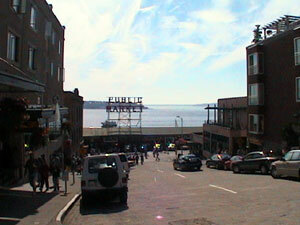 I went to the original REI store and had a cup of joe at the original Starbucks Coffee today as well. What a good tourist I am! 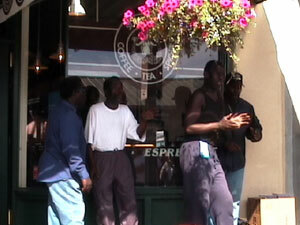 Here are some street performers singing in front of the original Starbucks.